Surveying the destroyed Joplin mosque. 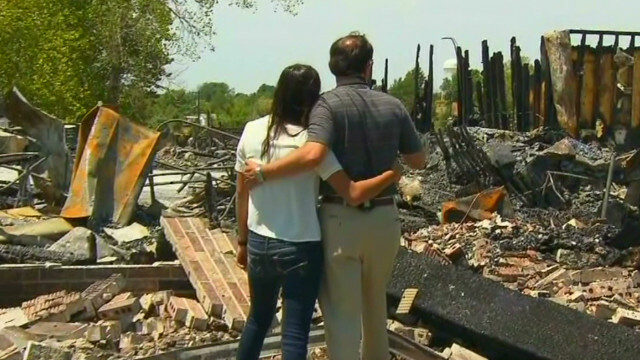 (CNN) - When 20-year-old Ashley Carter heard about a mosque burned to the ground in her town this week, she was shocked. "I was very saddened," she told CNN on Wednesday. "I thought it was very evil." So Carter, a student at Ozark Christian College in Joplin, Missouri, texted a friend, suggesting they organize an event "promoting acts of love." But quickly, the idea changed: They would organize a "rally of people coming together, from all walks of life, all religions, a really diverse group of people trying to promote this radical love." She called Kimberly Kester, spokeswoman for the Islamic Society of Joplin, whose worship house serving about 50 families in the southwest Missouri city burned down Monday. Investigators have not determined the cause, but the mosque has been attacked in the past. Kester supported the idea. So Carter and some of her friends created the plan for the rally and announced it on a Facebook page. The next day, Tuesday, word began to spread. By Wednesday morning, more than 400 people had posted that they would attend the event, scheduled for Saturday, August 25. Carter said she was inspired by "my love for Jesus. And I know that Jesus calls us to love people." "With everything that's been happening in the news this week" - which includes a shooting Sunday at a Sikh temple in Wisconsin that left six worshipers and the gunman dead - "I was pretty discouraged," Carter said. "Regardless of what you believe, I think everybody's entitled to loving whoever." Kester told CNN she and other members of the mosque plan to attend the rally. The response to the burning from people throughout the community has been "outstanding," she said. "There were representatives from different churches, different organizations at the site that afternoon speaking to the Imam. People have been calling anyone that they know that has been involved with the mosque, offering to help." St. Philip's Episcopal Church in Joplin is hosting an iftar - a meal eaten by Muslims after dark during Ramadan - on Wednesday evening. The Council on American-Islamic Relations announced that speakers will include members of the interfaith community. Sponsoring groups include the South Joplin Christian Church, the United Hebrew Congregation, the First Community Church and Peace Lutheran Church, CAIR said. Representatives of various Islamic groups will attend, Kester said. They will discuss the future and what provisions are needed to continue Sunday school and prayers. The mosque is holding daily prayers at someone's house now, and expects to rent a new place as soon as this week, although numerous religious institutions have offered their facilities, Kester said. "We're hoping for security and that type of support from our community," she added. Members say this is an opportunity to kind of start over and improve on things that we've always wanted to improve upon, like our security system or Sunday school facilities," she said. "It's a time for us to unite and focus on supporting each other. And yes, it's a tragedy ... but we want to focus on coming together and building a stronger community." No final decision has been made on whether the mosque will move to a new location, but there is a consensus to move inside the city limits, Kester said. "We feel that the response time for fire employees would be less if were in the city limits and it would offer us a little bit more protection and security." No definite plans will be made before an investigation is completed into the burning, said the mosque's treasurer, Navid Zaidi. "We need to get this crime solved, before we do anything." He said he hopes the rally is safe and that authorities keep everyone protected. Assuming the fire was arson, the perpetrator "is out there - he is loose," Zaidi said. Zaidi described the support coming from the community as "tremendous." A fundraising effort to help rebuild the mosque is off to an auspicious start. The website of the official campaign shows a goal of $250,000, with more than $40,000 pledged by Wednesday afternoon. A video for the campaign refers to the mosque as "our refuge in a crazy and hectic world." It shows what the mosque looked like, followed by images of the charred wreckage. Arsalan Iftikhar, an international human rights lawyer and founder of TheMuslimGuy.com, tweeted that he will donate a dollar for every retweet of his message. He quickly got hundreds of retweets. Iftikhar is a frequent contributor to CNN.com. Carter says she expects donations to be taken at the rally. And anyone who wants to donate money to cover the costs of staging the rally can through the Facebook page. Different kinds of bands will play, including religious bands, she said. And speakers will talk about "promoting love." "When there's an act of hate, you have a choice to make it something beautiful. So that's what this is all about: making things beautiful from things that aren't." –CNN's Anna-Lysa Gayle contributed to this report. Arab Christian churches should build churches next to mosques around the world including Murffreesboro and Joplin. Christian Arabs and Muslim Arabs share the same language, culture and traditions except religion. Christian Arabs could be the bridge for Muslims to adapt, melt and integrate to western societies perhaps converting to Christianity or at least understanding Christian ethical and moral values which are different from Islam. If this were a Shiite mosque and there is proof that it was arson, then there is a high probability that the arsonist was a Sunni Muslim. And vice-versa if it were a Sunni mosque. But to date, arson has not been listed as a cause. Maybe his initials are B.O. Adding to the growing tally of Islamic terror attacks and dead bodies during the ‘holy’ month of Ramadan, Boko Haram Muslim gunmen are suspected to have attacked another church and killed at least 19 people, including the pastor, in central Nigeria. There are websites keeping track of how many people the MUSLIMS killed in Ramadan this month. 3 weeks in they have slaughtered 818 people. How many people have the Christians killed in the name of GOD in past 3 weeks? Frank, Let me guess, Stephen Prothero, Dan Gilgoff and their ridiculous "Beleif Blog" didn't cover it though, did they? That's because they are part of the Satanic propaganda that portrays islam in a "good" light. LOL – SATAN? WHAT ARE YOU 12 KEITH? ttps, Thought I'd post this here so you wouldn't miss this. Let's let Bill Gates speak for himself, shall we? So Keith, let me get this straight. You think we should allow children to die of disease that could be eradicated with vaccines and starvation due to overpopulation. You think that birth control is evil and that people should be forced to bear children they can't afford to feed. Gates wants depopulation through the use of vaccines-or did you miss that part? No, dear. He wants to limit population growth by preventing the deadly diseases that force women in developing countries to have more children than they can feed to ensure that some of them survive. Now, excuse me while I go laugh some more at you and Jack. Obviously, I've really gotten to both of you sufficiently for one day. But seriously, KEEF, you need a psychiatrist. No kidding. Tom Tom...After reveiwing these comments, out of all the commentors on here you're more hateful than any so called bigot or athiest on here. I feel for your husband. Sure, Jack. No sour gra pes there, huh? You know that my posts are no more "hateful" than any of yours. You think that my calling you bigoted is hateful? That's your problem, not mine. You ARE a bigot. Look up the definition. You have been unable to put forth any argument that holds water. Telling an entire group they have to "bite the bu llet" and "accept responsibility" for murders com mitted by others who claimed to be of the same religion as theirs is nothing short of idiotic. I'm sure you'll call that "hateful", too, but again, that's your problem, not mine. Based on the laws of this country, Muslims are free to worship and they are not required to pay for the actions of a few extremists or prove anything to you. Can you show any evidence that proves these statements incorrect, or are you just going to whine some more? Legally you're right. They can do what they want. I'm looking at the big picture... what the future is with this religion in the US. I don't like what i see. you obviousley disagree. you have that right too... I just don't think youre being smart. I've based all my opinions and concerns on fact and history with a little life experience..
Tom also..It used to be legal to have slaves but that wasn't right so being legal doesn't make it right necessarily. Don't strain at gnats, Jackie. We don't abrogate people's rights based on what others have done. If you want to live in a country where that's the policy, then go there. What you're trying to do is inst itute a new form of government and overturn the laws that are the very basis of our freedoms. And you think others are extremists? Tom Tom... No I'm Not...I'm concerned for my children and grandchildren. I don't want anyone dictating a religion to them. Jack3, You got that right about her husband. Unless she's just a qu.eer and her husband is the butch. If she's straight, the guy ought to pay us by the minute for occupying her and giving him a break. She's demonic. Jackie, have you met your counterpart? This is Keef! He thinks Obama is a Muslim. Jack, you don't want anyone dictating religion to them?? Isn't that exactly what you're doing to others? How do you not see that you are creating the very sort of country you claim not to want? I know he LOVES this blog-might not have a clue what's being discussed, but loves it nonetheless. Poor guy. Tom, Whether you believe it or not, or whether you like it or not, Jesus Christ is coming back to establish His millenial reign from Jerusalem. It's gonna be a theocracy-but I doubt you'll be there to see it. No. You're trying to eliminate the freedom of choice upon which our nation was founded. You're not "protecting" anyone by doing that. Your children and grandchildren aren't being threatened by the "Muslim hordes", you silly goose. Now, there's little point in my bothering to discuss anything with you or the toothless pipe fitter, since you're both more interested in my husband. I hate to break it to you, but he's straight. He also has a job. I have to wonder about your other halves, though. Why is it you big studs aren't servicing them? Well Jack, I don't like what I see in the christian mythology in this country. I am surprised you don't see the mirror image of your mythology in the muslim mythology. You both think your magic man is the right one, and you want to force your myth on the rest of us at all cost. Tom Tom says...Why should Muslims have to prove anything to you or people like you? They don't. We don't as sume that people are terrorists when they've done nothing wrong, just as we don't as sume someone is a criminal unless proven guilty. The Muslims who built this Mosque haven't done a single thing wrong. Why should they jump up and down to convince you or anyone else that they're not extremists when they've done nothing extreme? Because they have a responsibility for their religion. Sometimes you have to bite the bullet to set things right even if it wasn't directly your fault. It's arrogant to think otherwise. Why don't all Christians jump up and down to protest the actions of the man who shot and killed an abortion doctor in cold blood in front of his family in church? Why don't YOU pay the price for the people killed by Eric Rudolph? I think what rudolph done was totally wrong and if I saw nothing was being done to him me and many more would've protested in one way or another. Not true Jack, because senator Walsh just went on record saying that muslims are trying to overthrow the US gov. You republicans always need a boogie man at the door to try to scare people to get votes. I am so glad I don't have to live around republicans. I think that after 9-11, if the muslims would've shown concern instead of dancing in the streets, cheering and showing indifference, not many of Americans would be concerned about the muslim religion. Instead of protesting when they wanted to build the mosque at Ground Zero, why didn't they protest against the extremists at Ground Zero? That would've shown that the extremists and the moderates were separate groups. Instead theyworshipped Bin Laden and cheered. What's a prudent person to think? Oh, really? All of them? No Muslims voiced their horror at the perpetrators of the 9/11 attacks? before casting any stones, perhaps you should study the history of American intervention in the middle east during the last 60 years. It may give you some perspective as to why Americans aren't very popular in that part of the world. Remember – your enemy is never a villain in their own eyes. What was seen on the media was very little and from leaders of other countries that were just being politically correct. I was very offended at what I saw. If the muslims were so concerned why didn't they protest against these extremists? They instead protested to buikld a trophy at the site of 9-11. I'm sure some felt bad but they need to understand our sentiments. they need to do something loud to show us that there is a separation. I'm not sold yet. Doc...which is it? are they concerned or do they feel it was justified? Only a few Muslims celebrated 9-11 Jack3, I am a Muslim and was horrified and angered when my country was attacked by those who not only highjacked my faith but attacked my country. I can only recall seeing Palestinians dancing in the streets and considering we let Israel do what they like to them it's no wonder they did. Stop lumping over 1 billion adherants to Islam into one large group, it makes you look like a bigot. here come the names from Tom Tom the girl. She does that when she can't think of anything intelligent to say. What else can a "prudent person" call someone who paints all who are different with a broad brush, Jackie? Shakira...I watched it very close as most did. They intervied muslims around the world. that was the image that I saw. I wasn't concerned with muslims at all before that attack and lack of response. I'm telling you the American public needs some reassurance. you can say you don't owe it but its a small price compared to the alternative which is resentment. TomTom... That's not what I'm doing and you know it. I have a legitimate concern. You said: "Why didn't they protest..."
You didn't say anything to qualify "they". You are generalizing. That is what bigots do. They only see people as a single enti ty and not as individuals. How often as an American Muslim do I need to condem the attacks of 9-11? Every day, once a month, once a year, for how many years. How many years will I as a Muslim be held accountable for the fanatics who did this? Tell me so I can be a good American in your eyes? How long? This word bigot gets thrown out a lot. Any time anyone disagrees with someone they're labled as a bigot. If you're against gay marraige, you're a bigot, if you're against a religion you're a bigot. I guess we could look at you as a bigot to our beliefs. We have legitmate and justified concerns and have a right to be concerned for our children. Shakira...You're doing wehat you're accusing me of. You're lumping all christians into one basket. The difference is, if a christian gets out of line many other christians will stand up against him. i don't see that in islam. It's not being aginst Islam, it's your sweeping genaralization about over 1.3 BILLION people who are Muslims Jack. You don't see a differance between the fanatics and the everyday Muslims here in America. That is why I and others have called you a bigot. You make no distinction between the two, in your eyes we are all the same which is not true. You don't see it because you don't look, Jack. You have preconceived notions about Muslims and you never look beyond them to educate yourself. You simply accept the easiest route. No I am not, I know there are many Christians who have nothing against Islam. Many of my friends are Christian and have no issues with me being Muslims. There are fanatics in every religion, Islam is not alone in that. I condem the person that burnt down the mosque, I condem the Westboro Baptist Church for pickiting the funerals in the way they do, I do condem terrorist attacks when I see them no matter the religion. I don't pain people with a broad brush. I see the vast differances there are in Christianity, Judism and dont condem and entire religion. BTW how long will I have to keep apologizing for 9-11 as a Muslim? TomTom... QWhat do you mean I don't look, do you know me? I watch very close. I'm a news hound, I watch a lot of informative media, i don't watch sitcoms and reality tv. I'm an old man, I watch National geographic and news. Shakira...yes but you insulted christianity and lumped the christians together by saying a pastor wanted gays to be killed. You're not watching neutral media, Jack, or if you are, you aren't watching it with an open mind and a great deal of skepticism. You might look, but you are only doing so from the perspective of someone with preconceived notions. Do you even KNOW any Muslims? At all? Do you ever talk to any other than on the internet? I do. And they're not the fanatics you believe they are. Don't you get it, Jack? Shakira was trying to show you how ridiculous your generalizations are by generalizing about Christians in the same way you're generalizing about Muslims? Are you being obtuse, or do you truly not comprehend this? Shakirs...Something louder than whats been done so far. you haven't done enough up to this point and you can see by these articles comments on this subject. Only the comments by people who are ignorant, Jackie. Tom Tom..here's where you guys miss the point. I don't hate the muslims unless ones attacaking me. i know a handful of muslims. sure there's some nice people among them but they don't control that religion. It's way bigger than them.I'm not even sure they know any different kind of life or can see life from our view to make an intelligent decision as to whether they want to be muslim. To me it looks as though the imams, clerics and radicals controll the direction of the religion. I don't hate the people, I hate the religion. Then you're just as much of a bigot as someone who hates all Christians because of the actions of a few extremists like the Westboro Baptist Church. edit: "who hate Christianity", not "all Christians". Your att itude is no different than that of a person who hates the religion of Christianity because the Catholic Church forbids the use of contraception. You are judging all Muslims based on your perception, which is skewed. Tom Tom...you're throwing that bigot word again. You're good with calling names but not good a solving problems. My answer to solve this problem is for Muslims to protest loudly that they are separate from the extremists. They can be arrogant, or do it and ease a lot of tension for themselves and everyone. Not that it is any of your business but yes I was. Born and raised in California if you must know. Any other questions about my citizenship you would like to know. Jack, if you don't like being called a bigot, then stop being one. If the shoe fits, Bubba, wear it. It fits you perfectly. And now I'm thinking you're not really here to discuss anything-you're just being your usual trollish self. Shakira...first, I don't hate you because you're muslim or hate you at all. I do have an opinion of anyone that needs any religion but that's another issue. I'm just concerned over what I've seen and from my view it looks like a run away religion that is out of control, and yes as you said was highjacked. I've looked and have seen very little show of separation. when we see countries at war against muslims trying to take over governments it makes me concerned as to what the impact will be over here when we get a large population of muslims. Why should Muslims be required to "ease the tensions" when the tension is being caused by bigots like you? Christians aren't standing up and "protesting loudly" when the Pope makes a proclamation, are they? Why should Muslims have to prove anything to you or people like you? They don't. We don't as sume that people are terrorists when they've done nothing wrong, just as we don't as sume someone is a criminal unless proven guilty. The Muslims who built this Mosque haven't done a single thing wrong. Why should they jump up and down to convince you or anyone else that they're not extremists when they've done nothing extreme? Tom Tom..Then what are you doing here. I don't read any intelligent remarks from you...just insults. i think you're probably a drunken old lady sitting at you computer drinking a beer this MORNING and throwing insults at anything you decide not to like. Get a life! "Tom Tom..Then what are you doing here. I don't read any intelligent remarks from you...just insults. i think you're probably a drunken old lady sitting at you computer drinking a beer this MORNING and throwing insults at anything you decide not to like. Get a life!" They aren't insults, Jack, they're accurate descriptions. If you don't like them, tough. Stop earning them. If you don't understand the concept of freedom of religion, or the idea that everyone is innocent until proven guilty, then why are YOU even in this country? Can't refute what I said, can you? Tom Tom...refute what part, the name calling? you've said nothing of any sense to refute. We invaded two countries and killed the man most responsible for 9-11, along with many thousands of others. How much blood do you want? Apolgoies for my absence during this debate, I had a job interview to attend. I am not going to continually apologize for 9-11 every time its brought up. I had nothing to do with it, 99% of Muslims didn't have anything to do with it. Stop lumping Muslims into one large groups, there are over 1.4 BILLION of us. I am not going to prove my Americanizim (if that is even a word) to anyone but me. I have condemed 9-11 and said it on here. If it is not good enough for you some of you then too damn bad. @Jack3- Yes you do have a right to an opinion and free speech as much as Muslims have a right to Freedom of Religion whether you or others on here like it or not. This girl is diong something to show not everyone is a nutter who hates Muslims. I think she should be commended for what she is doing and not villanized by some on here. Muslims are here to stay folks and you are not going to get rid of us, we are just as American as you are and have the freedom to practice our faith as you do. Get over it. Yeah, Jack, how about all those photos of blacks being lynched and the whites grining and acting like it is a day at the beach. Do you know where the term "picknic" comes from? Stood for "pick a Ni**ger and lynch him." You christians are just as murderous as anyone out there. And if you pray long enough, you'll miss the bus!! Nah – atheism is all good. Would solve many problems if people would clear their damaged minds of all make-believe characters. The statistical studies from the nineteenth century and the three CCU studies on prayer are quite consistent with the fact that humanity is wasting a huge amount of time on a procedure that simply doesn’t work. Nonetheless, faith in prayer is so pervasive and deeply rooted, you can be sure believers will continue to devise future studies in a desperate effort to confirm their beliefs! , . .
A lot of these posters complain about christians but if all the christians were gone and we only had the muslim religion imagine how it ould be. The non-believers and other religions would be harassed, and the gays would be killed, the women would lose their rights. We'd hear a different tune from these muslims sympathizers. On the anyone who complais about gays is gay remarks; so if anyone complains about a gay then thay are gay themselves? Wow! I guess I want to be muslim because I complain about muslims all the time, I guess I'd better give up and head to the nearest mosque. How exactly would that be allowed to occur in a secular governed country? Do you think everyone would just bow down to the wishes of a different set of religious freaks? Christian, Jewish, Muslim it makes no difference. The rational, skeptical and democratic people would never allow it...anymore than we would allow harassment of gays, removal of women's rights or any other fought for freedom. Oh, gosh, Jackie! What INSIGHT! What incredible thought you've put into this! Of course, we're all just going to give up and allow Sharia law to be enacted! Why wouldn't we? After all, there's no such thing as separation of church and state....oh, wait. Never mind. Yea Jack your right, no Chrisitans want gays to be killed right? A pastor just recently didn't say he wanted to put gays in a camp so they die out, or was that just my imagination? You're right. We would have a civil war. As muslims settle in countries they have a proven pattern as the population grows. the more the luslim population the greater the demands and more violent they become. I didn't make that up, thats a statistic based on past behaviors. As I said before, if it walks like bigot, Jack. That's what you're doing. Tom Tom.. If you're going to act like a 57 year old kid and call names then don't reply to me. I'm trying to have a discussion about this issue. I have a right to my beliefs. I have good solid ground and justification for them. No, you don't. And I'll continue to ridicule you when you display your ignorance and prejudice. If you don't like it, then too bad. I have as much right to free speech as you do, and that includes making a fool of you when you richly deserve it. So many need to understand what islam is really about. It's not here to blend in. Jack 3: I agree therefore the muslims are demading Shariah laws to be acknowledged and approved as part of our law of the land. Also, the honor killing (honor crime) has started surfacing....father/mother will kill their daughters/sons for leaving their muslim religion. Johnny, these brainless freaks don't have a clue. read their comments. They know nothing of the subject but have these opinions that make no sense what-so-ever. And of course, you're an expert, aren't you? If so, why are you here, Jackie? Why aren't you in an office in DC, working for Homeland Security? Or the NSA? Or the CIA? You're just SO well educated, surely the powers that be have courted you! Why haven't you accepted the job offers you've surely had? We can all see you're an expert on the Middle East and religious customs and tenets. What did you say when the administration came to you to beg for your assistance in rooting out terrorists that hide in Mosques and temples? Were you too busy managing the Nationals? Or was it the Giants you were coaching? Or maybe it was that mission to Mars that kept you much too busy to help our country get all those nasty Muslims out of the US. Do tell us how it is that such a mind as yours has remained untapped by the very highest office in the country! Actually Jack if it were not for the Hijab I wear no one would know I am Muslim. I love College Football, Baseball ( I bleed Dodger Blue) watch tv, play video games and live a American life. I am raising my son as a Muslim but also to be a Dodger fan, Bama fan, to say no anything Orange for it is the Giants and Univ of Tennessee colors. I am an American in everyway minus the Hijab I wear and not dressing like a h o o k e r.
Tom, Tom you post but you don't know where you jump. Jesus scores you lose. You stop but I don't walk. HeavenSent – for two years now, I have been ignoring every reponse you have ever made to any of my posts becuase, quite honestly, you are too fvcking stupid to bother with. I fully intend to continue with this policy and am only responding now so as to reaffim the contempt with which I treat you and your moronic posts. I hope you are an old lady with a withered brain, because only that can explain the breathtaking stupididty and simplicity of what you post. Please die very soon. point to just ONE example of shariah law being used in this country between non-muslim plaintiffs and/or defendants. Muslims are notorious anti gays. It is in their religion. Therefore, I am just wondering if the arsonist is gay and anti-muslim?...just wondering. Wonder no more Johhny Utroll. Opressing Muslims is not on the gay agenda. Their issues are with proselyting, pointlessly litigious Christian fundamentalists.